We evaluated the usefulness of short-term trunk diameter variations (TDV) as water stress indicator in field-grown grapevines cv. Tempranillo. Two indices were calculated from TDV, maximum daily trunk shrinkage (MDS), and trunk growth rate (TGR). The seasonal evolution of both indicators was compared with occasional determinations of pre-dawn leaf water potential and stem water potential, measured at early morning (Ψ s em ) and at midday (Ψ s md ) in irrigated and non-irrigated vines. In the second season, the effect of crop load on the vine water status indicators was also studied. Crop load did not affect either the vine water relations or the TDV. 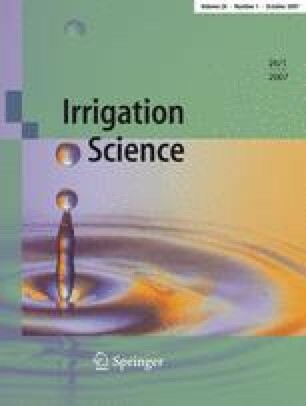 All water potential determinations had much lower variability and were more sensitive than both MDS and TGR to water restrictions. The ability of both indices to detect plant water stress varied largely depending upon the phenological period. In fact, MDS and TGR were only able to detect vine water stress during a short period of time before veraison. During this period, TGR was linearly related to both Ψ s em and Ψ s md , while for MDS a curvilinear, quadratic equation, better described the relationship with plant water status. After veraison no apparent relationship existed between plant water status and MDS or TGR. Hence, our results question the practical use of both MDS and TGR as variables to automate irrigation scheduling for grapevine. This research was supported by funds from the Generalitat Valenciana, Consellería de Agricultura, Pesca y Alimentación, Project Number 2002TAHVAL0034. We are grateful to the STR personnel for the meteorological data and to S. Pedrón, E. Navarro, S. Cárcel, T. Yeves, I. Yeves, and C. García for help in field determinations. We thank Dr. D. A. Goldhamer for sharing his data about trunk sensor in grapevine. We acknowledge the constructive and helpful contribution of the anonymous referees. The English correction of Michelle Rose (Cornell Univeristy, NYSAES) is gratefully acknowledge.